The minor league baseball season ended on Labor Day, about the time the school year was just getting started. Professional ballplayers get an offseason, but team mascots don’t. Cubbie Bear, for instance, the imposing but cuddly Iowa Cub ambassador to Kidland, was at McKinley Elementary School on Tuesday morning touting a new reading program for students. 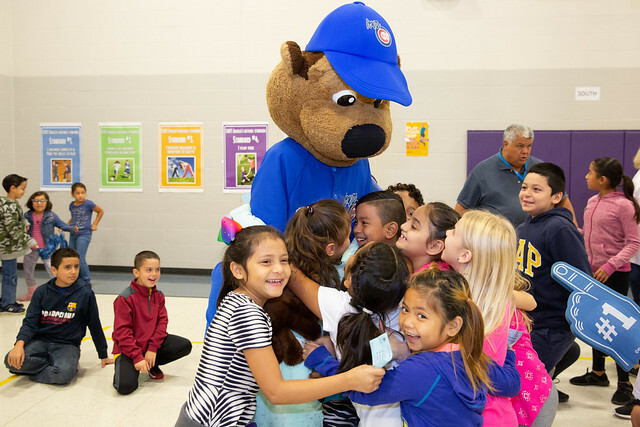 McKinley isn’t much further than a long home run from Principal Park, the home of the I-Cubs, and Mary Bernabe volunteers at the school throughout the year. Her husband Sam is one of the team’s owners and its President/General Manager. Cubbie Bear doesn’t talk much, so Mary handled the important announcements. Her book club donated the Iowa Goldfinch Award set of books recommended by Iowa librarians for preschool through 2nd graders and the Iowa Children’s Choice Award set for 3rd-5th graders to McKinley’s library. Principal Sarah Grady was the starting pitcher at an assembly in the school gym where the crowd was as spirited as the root, root, rooters at a ballgame. After a rousing cheer from the “Reader Leaders,” Grady was relieved at the mic by Bernabe, who shared the details of the Home Run Reader Challenge. All of the classroom teachers, decked in Tuesday’s uniform of I-Cub t-shirts, will keep charts to record how many titles each student reads, whether alone or with a parent or partner. As they round the book bases, students will earn prizes from the I-Cubs, including bracelets, tattoos, keychains and pennants. Anyone who hits the home run of all 20 books on their grade level list will earn tickets to a 2019 I-Cub game. Tuesday Cubbie Bear came to the Eagles. Next spring, they’ll flock to him.